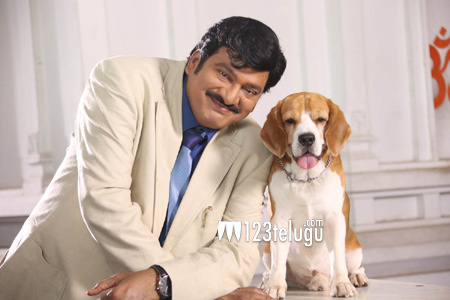 For a period story involving Rajendra Prasad and a dog, the unit is going all out to make it look as authentic as possible. Apart from the undisclosed remuneration, Rajendra Prasad was paid a whopping 14 lakhs just to get familiar and comfortable with the doggy that is for two weeks. The actor hasn’t shot for any film for those two weeks and all he did was to spend time with Boogie which is the dog’s name..Tommy is the name of the film. Rajendra Prasad never confined himself to a commercial film alone, he has attempted stories like Quick Gun Murugan and Dreams knowing it would be risky. Based on a real life story of a dog in Germany in the thirties it is directed by Raja Vannem Reddy and produced by Chegondi Haribabu. Chakri is composing music and Mohan Chand is handling cinematography. A Lovely Dog is the caption.